Leinster Clubs who would like to put Gala Details on this page should submit them to Tom Roche by eMail to info@swimleinster.com. Attached please find the Meet Information and the Hy-Tek Meet Events file for the Leinster Division Two Championship which will be held on Sunday May 5th. These meet information sheets should be read in conjunction with those for the Leinster Div One Meet which will follow at the end of May. In particular please note that any swimmer who has a Qualification Time for Leinster Div. One in any event is forbidden from entering the Div Two Championship. Swimmers with Consideration Times for Div One may enter the Div Two meet, and may also apply to enter the Div One meet on those Consideration Times, although they may not be accepted into the latter. We look forward to welcoming you to the NAC in early May. Note: As an aid for determining which swimmers are eligible to swim at the Leinster Division Two Championship (i.e. those swimmers who do not, in any stroke, have a Qualifying Time - as opposed to a Consideration Time - for Leinster Division One), the Gala Secretary has prepapred a Hy-Tek Time Standards file, which contains the Leinster Div One Qualifying Times. Also attached are instructions on how to import this file into Team Manager and use it to determine which swimmers are eligible / ineligible to compete at the Leinster Div Two Gala. Further Notes: Some problems have emerged with regard to the use of the Time Standards file above. The Time Standards file contains no age-up information, so it requires all swimmers to be aged-up locally to Dec 31st on their club Team Manager. The Time Standard files does not appear to be compatible with some other software packages (Team Unify perhaps?). Above all of this there were still some unexplained discrepancies. So, here is another, hopefully foolproof (!) means of determining eligibility for Div One / Div Two proposed by the Leinster Gala Secretary. He has created a "Dummy Div One" meet, taking out the Consideration Times and just leaving in the Qualification Times. He also changed the date of this Dummy Meet to August 31st to avoid confusion with the real Div One meet in late May/early June. Otherwise the Dummy Meet is identical to the real meet (events, age-up date etc, qualification window etc). Load up the Dummy Meet into Team Manager (or similar software), using the attached Meet Events file, in the usual way. Under Reports > Meet Reports > Meet Eligibility, create and print out the Meet Eligibility report. This will show all swimmers who have achieved the Div One Qualification Times. Swimmers listed on this report are not eligible to compete in the Leinster Div Two championship, in any event, individual or relay. Hopefully this will clear up any confusion. Please DO NOT send entries for the Leinster Div One Championship using this Dummy Meet. Attached please find the Meet Information and Hy-Tek Meet Events files for the Leinster Division One LC Championship Meet which will be held over three days on May 31st / June 1st / June 2nd (the June bank holiday weekend). Please note that both Qualifying Times and Consideration Times have been specified for this Championship Meet. The Hy-Tek file contains the Consideration Times, but only those with Qualifying Times are guaranteed their place in the heats. Those with Consideration Times will be accepted as swimmer numbers and pool time allows. Proof of time will be required with all entries. This competition is only open to swimmers who are both registered with Swim Ireland in the current year and are attached to clubs in the Leinster Region, or members of the High Performance unit based at the NAC. We look forward to a great Championship Meet over the June weekend! Sliabh Beagh Swimming Club invite you to their Junior Open Gala in Monaghan on 6 Apr 19. It is a Level 3 Gala suitable for IAG DIV 2 qualification. Closing date for entries is 20 Mar 19. Full Gala Details and HyTek Meet Events files are attached. Please find attached full Gala Details and HyTek Meet Events files for the Kilkenny SC Spring Gala to be held at the Watershed, Kilkenny on Saturday April 20th. Wexford Swimming Club welcomes all swimmers registered with Swim Ireland to their WSC Summer Meet which will be held on Sunday May 12th, with long-distance events held on the previous evening, Saturday May 11th. The is a Level 3 meet, replacing the old "Last Chance Saloon", and offers swimmers the opportunity to get short-course qualifying times for the Swim Ireland IAG Div 2 and for the various regional championship meets. Full electronic timing will be in operation, and Swim Ireland qualified officials will supervise. Aer Lingus Swimming Club invites you to the 2019 Aer Lingus Swimming Club annual gala taking place at the ALSAA complex on 25th and 26th May 2019. This is a level 3 licensed gala with times achieved suitable for qualification for the 2019 Irish Division 2 National Competition. Attached are full Gala Detaills and HyTek Meet Events files. The gala offers plenty of healthy competitive swimming across 50m, 100m and 200m events, in a fun and relaxed atmosphere. As mentioned, times achieved are suitable for IAG2 qualification. On that basis and to ensure we can provide the opportunity to allow entry for as many swimmers as possible looking for qualifying times, we are asking all visiting clubs to specifically exclude entering swimmers into events on offer for which they have already achieved qualification times for this years Summer Nationals and National Division 2 competitions. To assist with this criteria, “Slower than” qualification times are applicable for some of the events included in the Hytek events file attached. The specific details are outlined in the pdf meet invite. Swimmers are each allowed to enter into a maximum of 4 individual events. An entry time must be included for each swim. NTs will be rejected. Clubs are allowed enter a maximum of 1 team per relay event. Additional qualification criteria may be introduced as required in order to ensure the gala is completed within the maximum number of competition hours allowed per day. All Clubs will be advised of any such criteria as soon as possible.All entries must be sent via Hytek file only to galasecretary.alsc@gmail.comby the entry deadline of 11th May 2019. There will be no charge for scratches received up to 24 May 19. Parking will again be available at the ESB car park adjacent to the pool complex. Parking permits and warm up details will be provided to you in good time before the gala start date. We very much look forward to seeing you at the ALSAA complex at the end of May for a fun filled and competitive weekend of swimming. 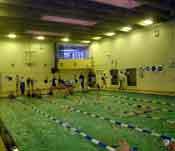 Wexford Swimming Club is pleased to circulate details of our annual Small-Fry Gala (Level 2). This gala will focus on providing relaxed competition and a fun "end-of-season" day for our younger swimmers, and has been moved a little later in the swimming calendar to Sunday June 16th. The Gala details and the Hy-Tek Meet Events files are attached. We will provide full electronic timing and diving blocks will be set up (although swimmers may start in the pool if they so prefer). Entries are open for those aged 12 and under; for swimmers in the 13-14 age bracket, there are "slower than" qualifying times which apply. Swimmers in this age range who are too fast for the Small-Fry gala are welcome to compete in our Summer Meet on May 12th. A warm welcome awaits you in Wexford in June. As an environment-friendly measure, Leinster Swimming will no longer distribute bottled water to timekeepers / officials / coaches. Instead, a water cooler will be provided in the call-room. Timekeepers, officials and coaches are requested to bring their own water bottles with them and are welcome to re-fill them at the water cooler as required. The Leinster Trainability Squad commences in the NAC in on September 29th, 2018 at 16:00 – 18:00 and on Sunday 30th, 2018 at 08:00 – 10:00am. Information regarding the squad is outlined in the attached document. A separate link to the application form is here. Attached please find the updated 2018 Meet Licence Guidelines and Criteria. An updated application form will be issued in due course. As part of the application process, all clubs in Leinster wishing to hold/host a competition must apply to Leinster Swimming for a date to hold their competition. We will collate the calendar for the region and work with clubs to ensure there are limited/no clashes with dates. Any club events not included on the calendar by the closing date, may not be eligible to receive a licence at a later date, as part one of the process is to apply for a date in advance of the season. The season plan is attached so you can see available weekends. Please note that no competitions can be permitted to be held on the same weekend as a National Competition, and no competitions are permitted to be held the weekend of the Swim Ireland Congress/Awards or the day of the Swim Ireland AGM (these dates are noted on the Season Plan). Could you please submit your requested dates by Sunday July 16th, to leinstergalasecretary@swimireland.ie. We will review the dates, sort out any clashes and submit the calendar to Swim Ireland to be included on the National calendar along with the other regions. This will then be published on the Swim Ireland website. Click here for the new line-up procedures for Leinster Galas. They worked very well at the Graded on 25 Oct and will be used going forward. Master's News, Records and Claim Forms are available here on the Swim Ireland web site.